The Ariane-5 launcher placed SMART-1 into an elliptical orbit around the Earth. Under the control of the European Space Operations Centre (ESOC) in Darmstadt, Germany, on two days per week, repeated burns of the ion engine changed the ellipse into a circle, gradually expanding it into a spiral. Month by month, the Moon revolves around its own orbit, 350 000 to 400 000 kilometres from the Earth. As SMART-1 gained distance from the Earth, its speed slackened. 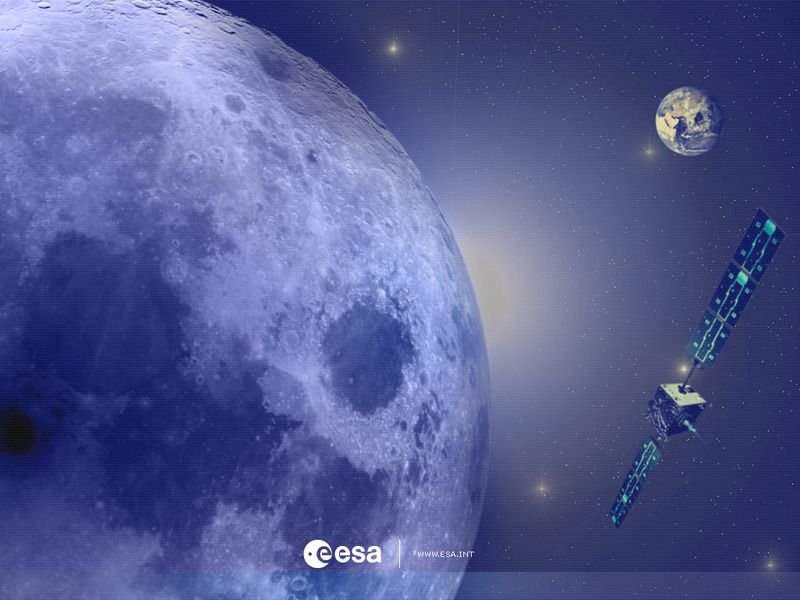 When 200 000 kilometres out, the spacecraft began to feel significant gravitational tugs from the Moon as it passes by. Mission controllers then, bringing in a new era of space navigation, for the very first time, used the sustained thrust of electrical propulsion jointly with manoeuvres under gravity. Isaac Newton knew nothing of such tricks, and ESA's experts had to invent fresh mathematics for figuring out the best orbits. The tug of the Moon's gravity will at first helps to widen the spiral orbit, in regular encounters called 'lunar resonances'. By the time SMART-1 passed within 60 000 kilometres of the Moon, the effect of gravity was much more pronounced, in encounters known as 'lunar swing-bys'. At a crucial stage in the journey, called lunar capture, SMART-1 passed through an invisible doorway in space at Lagrange Point No. 1, or L1 for short. As first noted by the mathematician Joseph-Louis Lagrange in 1772, the gravitational effects of the Moon and the Earth are in balance at L1, 50 000 to 60 000 kilometres out from the Moon on the earthward side. Beyond L1, SMART-1 flew over the lunar north pole, aiming at a point of closest approach above the south pole, so achieving a wide polar orbit around the Moon. During the weeks following its capture by the Moon, SMART-1's ion engine gradually reduced the size and duration of this orbit, to improve the view of the lunar surface.